Scotland international footballer Leigh Griffiths is understood to have been arrested on suspicion of shoplifting in a supermarket. 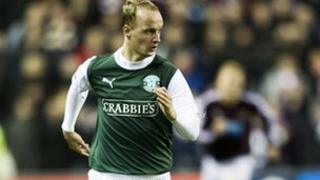 The Hibernian striker is believed to have been detained by security guards at a Tesco store in Edinburgh. Lothian and Borders Police confirmed a 22-year-old man was arrested and charged in connection with an alleged shoplifting incident. Griffiths is likely to appear in court at a later date. After the incident, Griffiths - who is on loan at the SPL club from Wolverhampton Wanderers - tweeted that it had been "something over nothing". He added: "got taken to the back, asked about it, looked on CCTV and I was away, simple as that!" Other tweets said: "Iv been caught shoplifting but I'm tweeting? Pretty sure I'd be in a cell??? Think about it! #hugemisunderstanding" and "Not been caught shoplifting at all". A Hibs spokesman said: "The club is aware of an alleged incident which took place on Saturday afternoon involving the player. This is now a police matter." Griffiths, who has scored 15 league goals for the Edinburgh club this season, made his full Scotland international debut against Luxembourg last year. He played from the start of his club's SPL match against Aberdeen on Sunday afternoon. Earlier this month, Griffiths was criticised for telling someone to "go back to your own country" on Twitter.